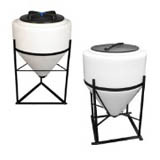 These Double Wall Tanks are quality plastic tanks that are designed with dual walls to provide you with more efficient and lasting storage of your materials. 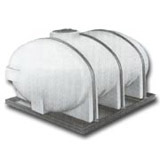 With an secondary tank wall that complies with 40CFR-264.135, these double wall tanks cansafely store hazardous or potentially harmful materials and prevent them from entering the environment. Additionally, their enclosed top design keeps stored materials safe and prevents necessary liquids, such as rain or snow, from entering the tank an causing it to overflow. 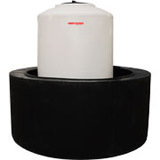 Made from polyethylene, a material high in resistance to impact, chemicals, rusting, and corroding, these tanks are safe and efficient units for storing all your materials. Questions? We can help! Call our team at +1-772-646-0597 or fill out our quote request form to discuss your requirements. Resin complies with U.S. Food and Drug Administration regulation 21 CFR 177.1570 (c) 3.1 and 3.2.